A half-day package to KANTA ELEPHANT SANCTUARY offers visitors an enjoyable opportunity to spend quality time with elephants in their natural home, as well as gain an insight into their history and behavior, and create cherished lifelong memories of their time spent with these amazing animals with friendly, happy elephants in a safe and sustainable environment. 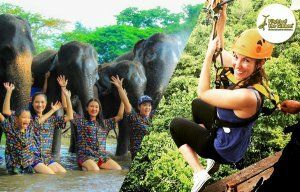 Kanta Elephant Sanctuary has teamed up with a leading Flight of The Gibbon eco-adventure experience to bring you a special one-day tour. A full-day package to KANTA ELEPHANT SANCTUARY package offers visitors the opportunity to get to know each of the remarkable elephants and gain a special understanding of their daily lives and behaviors. Experience life with the elephants in their natural home as well as gain an insight into their history. Spent a time with these amazing animals with friendly and happy elephants in a safe area. Feed, Cook Herbal, Roaming and Bathing elephant in the River.